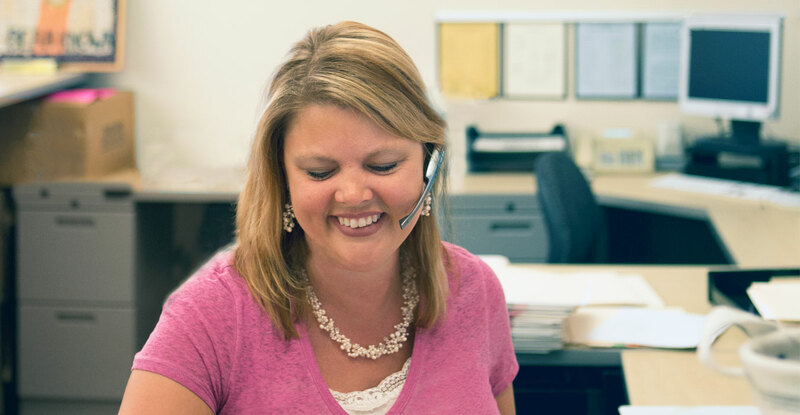 To many students and employees at George Fox University, she is known as the switchboard operator, the woman who always has candy and a friendly smile waiting for anyone and everyone who comes to visit her desk. “She is so patient,” a student comments as yet another phone call is calmly and competently answered. 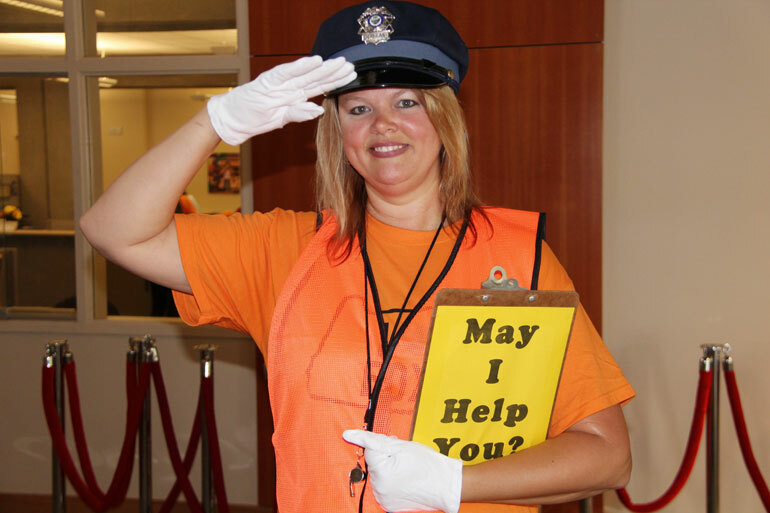 Despite the often-hectic demands of her job, Barbi Doran is not one to be easily ruffled. If you have ever been on the first floor of the Stevens Center (or really anywhere in Stevens), chances are you have heard Barbi’s infectious laugh. There is an equally good chance that you have received a warm hug from her if you have ever been within a 20-foot radius of her desk. “Backpack hugs,” as Barbi calls them, are one of her favorite parts of her job as the university’s information services coordinator. For Barbi, being the main source of knowledge about the university for students, campus visitors and everyone in between is about so much more than providing accurate information. Barbi gears up for a long day of helping students and visitors find their way around campus during the university’s annual Welcome Weekend. Despite the fact that Barbi has worked at George Fox for six and a half years, it is clear she is just as excited about her job today as she was on day one. Because it is impossible to know in advance what questions and situations will come her way, every day provides new challenges and joys. One day in particular proved to be no exception. Having just received a sizeable stack of university window decals from the marketing communications office, Barbi spent much of the day interacting with students who had heard they could come get a free decal at the switchboard in Stevens. Not one to miss an opportunity to have some fun, Barbi happily handed over the window decals only after each student performed a talent or a “happy dance” to her satisfaction. From personalized serenades to somersaults, the first floor of Stevens was a veritable America’s Got Talent audition stage for most of the day. Barbi loved every minute of it. Whether they are coming for free goodies or with a question about the university, almost everyone who visits Barbi has some kind of need. In fact, this is one of the things Barbi loves most about college students. But it is not always chocolate or window decals that students are in search of. For many students, Barbi is a much-needed listening ear. Although Barbi thrives on the personal interactions with individuals who visit her desk, a large part of her job involves answering phone calls on the switchboard. As the first line of defense for incoming calls to George Fox, Barbi is often kept on her toes by seemingly never-ending calls. She describes the amount of calls she receives during any given amount of time as “feast or famine”; either the calls come in one on the heels of another, or the switchboard remains silent for a time. Because the demands of her job are so unpredictable, Barbi has an incredible organizational system in place. From sticky notes for herself to having the schedules of the entire undergrad admissions staff nearly memorized, Barbi likes to keep her priorities right in front of her. She writes lots of things down, even “the little stuff,” and tries to handle things immediately as they come to her. “If I put them on the backburner, sometimes they fall off the stove,” she quips. Often Barbi finds herself juggling her desire to care for individuals and doing her job. She says she takes time in the slower moments to spend time with people, but it is not always possible to plan the timing of those interactions. “I tell them, ‘I really want to hear what you have to say,’ or ‘I want to pray with you.’” Even though those conversations are often interrupted by incoming phone calls, Barbi has a knack for making each person she interacts with feel like he or she is important. While some may chalk this up to natural social graces, Barbi knows where her gifts truly come from.